Life With the Bauer Bunch: Our baby's growing up! So we've reached an important milestone in Nathan's life - the big 22! When he went to the doctor for his stink eye Monday, he weighed in at a whopping 22 pounds and one ounce, meaning he has officially outgrown his infant car seat. *tear* He is just growing up entirely too fast and he needs to stop it! However, he is definitely too big for that little thing, as you can see in the picture that was taken last night. Remember when he looked like the world's tiniest peanut in that seat? I'll post a picture of that, too, for those who don't remember. 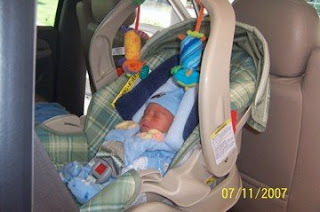 (That picture was taken the day he came home from the hospital) Now his legs dangle off of it and he just doesn't fit. So check him out in his new, super awesome big boy seat! Those were taken this morning. That's it, I'm officially in love!